Nowhere else on earth is the power of water to create, shape and sustain life as dazzlingly evident as on the island of Sri Lanka. Rising from the waves, it is a land where not one, but two monsoons mark time each year. A world where rains pour down, clouds swell, rivers flow and mists dance across the skies – where frosts dust the highlands and thousands of man-made lakes form a curious wonderland, filled with a wildlife that is strange, beautiful and utterly unique. This three-part series delves into a land that harbours spectacular creatures – from the largest mammal on earth, the blue whale, to tiny ants that swarm through the rainforest. We discover how – from the moment Sri Lanka fractured from the primeval supercontinent Gondwana and drifted to its present position – this island has been ruled by one unstoppable force: water. Until recently, a quarter of a century of civil war isolated Sri Lanka’s wildlife from the world. But now that war is over – and Sri Lanka’s once-troubled waters are parting to reveal unseen ecological riches for the very first time. 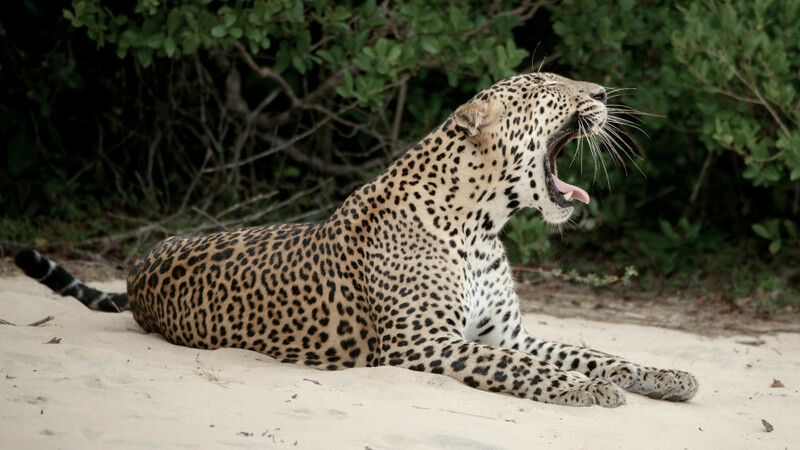 In the grasses of Sri Lanka’s scrub forests, a leopard stalks his prey. Here, food is plentiful, as populations of deer feed on the grass sustained by thousands of man-made lakes. These pools of blue are the centre of life on the flat plains of Sri Lanka. Because, as the monsoons recede and the sun scorches an otherwise parched land, these lakes nourish the land. Being the earliest nature sanctuary on earth, this ancient hydraulic system creates a playground for the mega fauna of Sri Lanka, charismatic mammals whose abundance pays testimony to the awe-inspiring power of water over this tiny country’s rich wealth of natural history. The forests of Sri Lanka rise above the rest of the country like islands out of the sea. Here, species found nowhere else in the world have been marooned on high forest plateaus, isolated from the rest of Sri Lanka, as they are unable to cross from one patch of forest to another. These wooded areas have evolved into highly diverse, self-supporting arboreal outposts – between which bats and birds fly with messages from outside. These forests are islands within an island – to step into them is to travel to another world where life is sustained by cloud swells and dancing mists. And as this mountainous terrain is exposed to not just one, but two monsoons each year, a distinct microclimate has formed among these cloud-cloaked trees. Nearly half the island’s flowering plants are found here, and amidst the twisted vine and creepers, rare and delicate orchids dot the landscape. Blue magpies, red-slender loris and purple-faced monkeys inhabit this strange, colourful – and ever-diminishing – world. But although forest habitats are in decline, thanks to the encroachment of man one thing remains certain: As long as it has water to sustain it, life – the fabulous, curious, glorious life that flourishes on these high peaks – remains. As the sun rises over the blue waters off the southern coast of Sri Lanka, the largest mammal on earth breaks the surface. Beneath these waves lives a unique population of pygmy blue whales, which feed, mate and play close to the shore in greater numbers than any other blue whale population on the planet. Amazingly, the key to their existence lies hundreds of miles inland, at the top of Sri Lanka’s highest mountains. As the monsoon rains pour down onto the land, over a hundred rivers flow from the mountains, carrying with them precious nutrients which flood through the land and into the seas. From tangled mangrove forests to pristine white-sand beaches, Sri Lanka’s coastal waters present a show of nature’s most magnificent marine mammals. As turtles lay their eggs on palm-fringed shores, Sri Lanka’s iconic stilt fishermen wait for the shoals of herring and mackerel, which the changing seasons bring. And out at sea, thriving coral reefs hide ancient wrecks filled with fish, while hundreds of dolphins race among the waves. This is an oceanic island where water, above all things, rules. From the goliaths in its ocean depths to the little-known mysteries of its cloud-shrouded peaks, ‘Wild Sri Lanka’ is a journey through an unseen ecological lushness found nowhere else on earth.